Kjos Music has provided directors with many books that are useful for the lone musician or within a complete ensemble. First Place for Jazz is another great addition to that tradition. 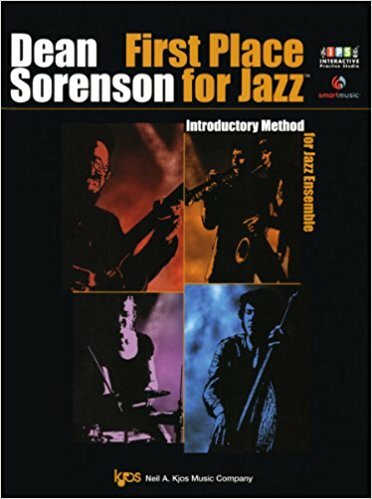 It’s aimed at the jazz beginner with moderate technique, surely applicable for middle-school or newly introduced high-school students. The collection includes inexpensive editions listing for $9-$10 for each of the typical jazz band instruments—including vibes, drums, and percussion—plus flute, clarinet, horn, baritone-treble clef, tuba, and a director’s score. Each instrument’s edition is fully usable on its own. The trombone edition easily lays flat on the stand, is clearly readable in text and musical notation, and comes with an inside-cover index that neatly organizes the contents. What’s so impressive about the book is its versatility: the index demonstrates that within this concise book you will work out in three keys, B-flat, F, and E-flat, using Major, Mixolydian, Dorian, and Blues scales. You’re given basic exercises, for which you’re provided audio examples of phrasing via the “First Place for Jazz Interactive Practice Studio” (IPS) found online, using a license-key unique to your book. You’re provided a specific checklist for your progress. You’ll learn a dozen different charts, playable by yourself or with combo or big band since you’re provided both a scored trombone part and a separate lead-sheet, both in bass clef. Chord symbols are provided. You can also enjoy performing them with the downloaded tracks, even changing the tempo if you wish. Users can also record themselves using the IPS. Sorenson, a trombonist and the Director of Jazz Studies at the University of Minnesota, offers the reader notated music in the moderate range of b-flat up to e-flat1 for most of the charts and exercises; there are no mandatory trigger-notes. The books are also available as e-books. The IPS is apparently available as an iPhone, iPad, and Android app as well as on the SmartMusic platform. The student can even use an in-app feature to e-mail a recording of practice over to his or her teacher. With its versatility and aural and visual learning paths, First Place for Jazz offers any entry-level jazz musician a supportive road towards growth, whether practicing alone, with tracks, or within an ensemble.